There is no point in hiding it, I love a good love story. So when the opportunity presented it self to read With No Regrets, I figured why not. It was presented to me as a clean contemporary romance fiction. Since I've been on a YA/teen action sci-fi kick, I figured I could use the change. I'll admit, this was not what I expected, but then again, I didn't really know what to expect as this is a genre I generally don't go searching for. But Ford brought to life a group of characters that were all hurting and searching for answers in a way that drew me in. I had to find out how each character fared. 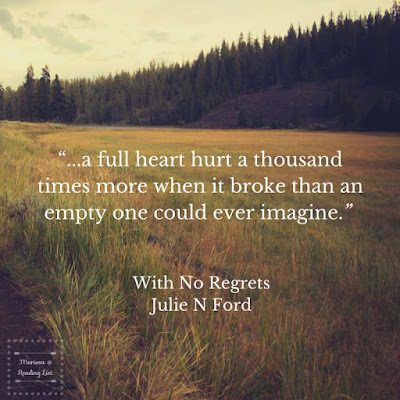 With No Regrets by Julie N Ford follows Finley as she tries to find her footing as life swiftly changes. She just divorced her husband of twenty years when she found him cheating, again. Her children have moved out to go to college. Which means she has plenty of time to finally discover what she wants out of life. Her best friend, Cathyanne, seems overly interested in making sure Finley finds a real love in a hurry. So she gently, well not too gently, pushes Finley into going on a date with their gorgeous and younger fitness trainer. Soon Finley is loving the active life Josh introduces her to, but she still longs for more. She is torn between a long time friendship with her Country Music star neighbor, Quinton, the fun life Josh offers, and the familiarity of life with her ex-husband, Roy. All while trying to find her own path. I enjoyed the change in voice in that made this a contemporary novel. The topic of a uber-rich divorcee wasn't really my first choice, but as I kept going (I always read at least 100 pages on a book submitted to me, before deciding to put it down) and honestly I was into the characters before that point. There was just something about Finley's inner dialogue about her life that interested me. I also really clung onto the side characters. Cathyanne, Finley's best friends, for some reason, really drew me in. She was outgoing, and really loved Finley. While I don't want to give away the big twist in the book, hint, it involved Cathyanne, I was shocked and moved. The other side character that grabbed me was Quinton, Finley's next door neighbor. He was one of those characters that I wanted to dislike, or brush aside, but couldn't. He just had a certain connection to Finley that kept getting pushed aside. 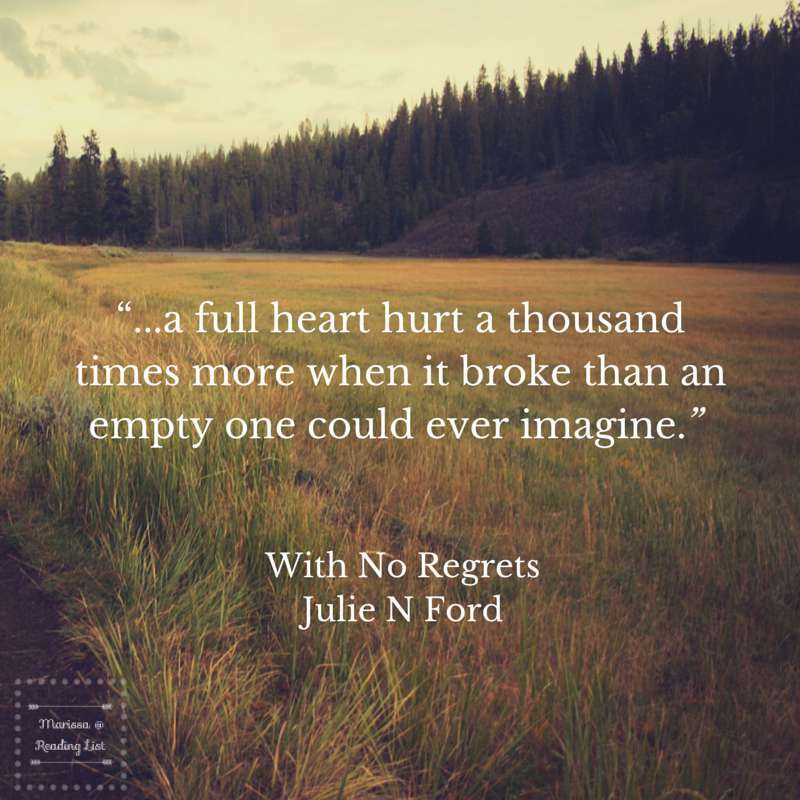 With No Regrets is certainly mainstream, which can be a shock to the system if you have been reading Christian books, both non-fiction and fiction. So heads up, this is not really a Christian novel. There are many adult scenes in relationships outside of marriage, so if that makes you uncomfortable, you might want to avoid this. Granted they aren't graphic, but I'll be honest there were some that just didn't read well for me. If you really enjoy romance and love stories, this could be for you. Finley reads like a modern Southern Bell, living in Tennessee. She loves gardening and coaxing plants to life. So if you are into gardening, and being outside, you could really get into this one. Also, if you are divorced, this could grab your attention. I'm giving this book a three heart rating. While I enjoyed it while I was reading it, and at times was very interested, I doubt I'll read it again. For some, who really enjoy this genre, this will seem like an unfair rating. This isn't a book for teenagers surely, it probably wouldn't interest teens anyway. Also, if you want completely clean Christian stories, you might want to pass on this one. 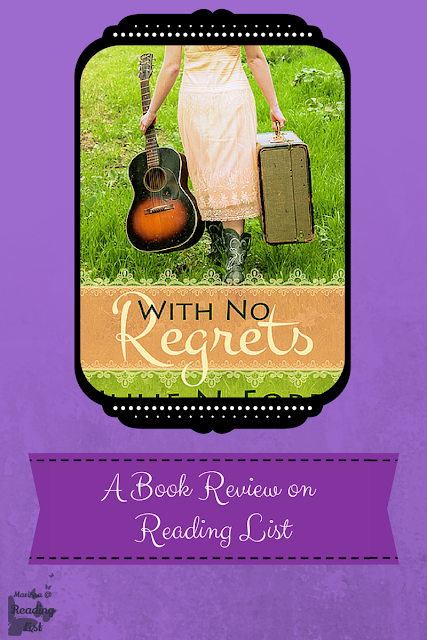 Are you into Contemporary Clean Romance books? Do you tend to read Christian Romance? Share with me your favorite. ****I received a copy of this book in exchange for my honest review from I'm a Reader, Not a Writer. The above review is my own opinion.